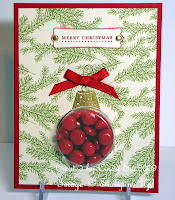 Here are a couple of the cards we made yesterday in the class I held at my house. Originally, I had planned to do two of the style on the left for Halloween and two of the style on the right for Christmas. But between the time I scheduled the class and the actual date of the class, I discovered some pretty cool variations on the theme, so I just had to incorporate them! The first idea (below) is by the very talented Becky, from the Inking Idaho blog. 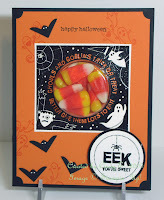 She came up with the exceedingly clever sliding window idea for accessing the candy without destroying the card! 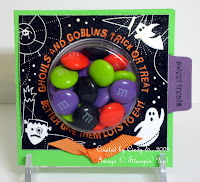 So, have any of you noticed that the Halloween M&Ms are nearly a perfect match for Green Galore and Perfect Plum? (Ignore my color-distorted photo and check it for yourself!) It's a match made in heaven, to be sure......Stampin' Up! and chocolate! I'll save the fourth card for tomorrow's post.